One of my favorite things to talk about in fashion is shoes. Since I’ve graduated college I have money to actually to buy nice things. I have been working on growing my collection of shoes. I try to buy all different types and styles of shoes so that I will have a pair for any event. When I was thinking about spring related blog post and what I could write, I got inspiration from seeing all these other bloggers shoes! I kept screenshotting them so I could go back and buy them but, I was “no, just do a blog post with all your favorite shoes”. Thus, the spring shoe guide was born. 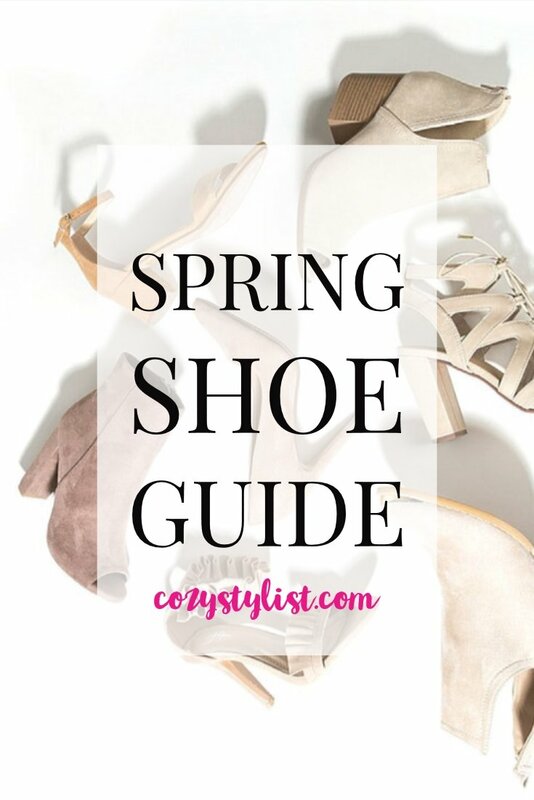 It made sense that I create a little guide to all the best shoes for this spring season. From sneaker and sandals to flats and mules, there are so many different types! Spring, however, is a weird time of year where you don’t know if you should be wearing boots for sandals. The weather can be so unpredictable it can make it hard to get dressed in the morning. I’m here to provide a list of ways you can style all these shoes and the best outfits for whatever the temperature is outside. The big shoe style that I have seen this season are Espadrilles. I googled the exact definition of them because I wanted to be sure what I was talking about. But basically, an espadrille is a flat or wedged shoe that has a canvas or cotton fabric upper and rope-like bottom. I haven’t really seen this type of shoe before this season and I really think that they are the perfect shoe for spring and summer. You can wear them with skinny jeans or a long maxi dress or wear them with a cute summer dress at a barbecue party. I honestly love a good pair of sneakers (tennis shoes, tennies) because they last forever! I still have quality sneakers that I bought in high school that are still in good shape. Like every spring season, sneakers come back into style. I think it’s because the weather is warmer and people are working out more so they need new workout gear. But, this particular spring season the “dad shoe” is in style thanks to fashion week. You will see many street style fashion bloggers talking about the “ugly shoe” which are just sneakers that are big and bulky and look like the opposite of fashion. Luckily for us, stores have better, cuter looking sneakers that we will actually wear. I for one love the blush pink sneaker trend! Flats have always been a part of my wardrobe, they are a staple and will go with almost anything that you wear. This season we are seeing a lot of espadrilles style flats as well as ankle straps and bows. Another big style this spring is mules. Mules are basically just open back flats, and I LOVE THEM. Target has some really really cute mules that I wear all the time. They are perfect for this time of year because they look cute for spring, but they will also keep your toes warm because the weather is still a little chilly. You can dress them up or wear them with a t-shirt and skinny jeans. My next purchase will definitely be those old navy pointed toe flats, they’re so cute! Ankle boots or “booties” are pretty much my go-to shoe all winter long. They look good with long sweater dresses or with thermal leggings. For spring though, I love peep-toe booties. They are just like the regular ankle boots that you know and love, except that they have an opening at the toe! They could also have an open heel. These shoes, in my opinion, are the perfect spring shoe. I have them in pretty much every neutral color because I wear them year after year and they go with everything in my closet. Tan/brown peep-toe booties will match with a lot of different style outfits. They will go well with jeans and a t-shirt, or with a cute skirt and blouse, or you can wear them with a dress for a cute spring look. I love your sandals and pointed toe! I can’t wait for the weather to clear up so, I can wear my spring shoes. Thanks for.sharing your favorite spring shoes! I love the Nordstrom black flats! (The ones at $59.99)! I’m not big into shoes but wonderful, informative post for anyone who is. great post! i’m a huge fan of wearing vans during the spring and summer months! i’ve also discovered a new sneaker brand called Allbirds, that are going to be on my feet all spring! Shoes are my favorite accessory so I loved this post! I have been wearing mules to work and they are perfect for the office as well as transitioning for after work drinks. I love all these shoes. Great List! I love this shoe guide. One of my favourite spring shoes is espadrilles. I’ve had a pair for about 6 years and they are still going! I love getting shoes that last!! Something I’d really like to get are mules. I think they look really cute and they are so versatile! Espadrilles, sneakers and flat shoes are pretty much all I wear. I love those leopard print flats and the black espadrilles. I’m going to England in June and need to pick up some easy to pack shoes…this gives me so many choices! Great post. How funny! I was just thinking about Spring shoes today! There’s definitely some great options here! Thanks for sharing! I love the shoes from shopbop.com, they look so comfortable and stylish. I am loving all of these options! Those boots are so cute! I’m looking for some new sandals for the summer, so this guide came just in time! Many beautiful shoes here. 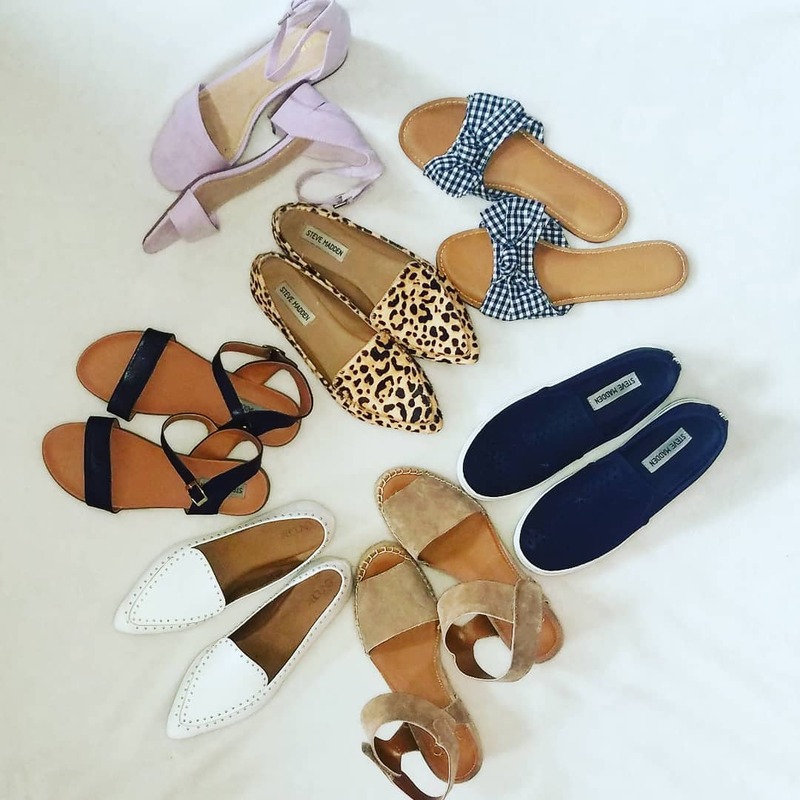 I love this whole list, but espadrilles are my all time favorite! Great round up here! I need to get a pair of leopard print loafers, I feel like they are the kind of shoe you can wear all year round! Those mules are super cute. I definitely have to grab some of those.